Review of Jonathan Bluestein's "Research of Martial Arts"
I occasionally receive books for review and I can privately say that in many cases they turn out to be disappointing. Others are, however, the complete opposite. This is the case with Jonathan Bluestein's Research of Martial Arts. To call this work "epic" would be understated. What Jonathan has done is really quite unique - and that is put down what appears to be his life's study into external and internal martial arts styles into book form. If anything, it shows the depth and breadth of Jonathan's knowledge. In Part 1 Jonathan does a comprehensive dissection of the fundamental differences between the "external" and "internal" traditions of the Chinese (and related Okinawan and Japanese) martial arts. While I have my own ideas on this topic and they vary from Jonathan's here and there, I couldn't fault his thorough and thoughtful treatment of this topic within his own paradigm. I'm fairly sure that there will be legions of martial arts practitioners who will agree with him on most, if not all of his points. The fact that they are presented in one place, in such a complete way, means that for many traditional martial practitioners - particularly those tending towards the internal arts - Jonathan's book is really a "must-buy". He begins with a fairly accurate and detailed description of the "external" method, examining the importance of such factors as physical conditioning (stamina, flexibility and "iron shirt" type training) and training reflex responses. The fact that he references both legendary karate masters, like Higaonna Morio Sensei, 10th Dan, and modern combat sports fighters like boxer Manny Pacquiao, is both pertinent and informative. He then proceeds to outline his understanding of the "internal" method. Again, while I don't always agree with Jonathan on every point, I can't help but be impressed by his thorough treatment of what I perceive to be the "orthodox" view. He also does so in a way that is thoroughly "modern", covering such "hot" topics as proprioception and interoception (fascinating areas that really do profit from closer analysis), the role of "intention" and, of course, the current "it" word, fascia. Jonathan then proceeds to give a comprehensive account of such traditional wisdom as the "six harmonies", "dragon body" and "short-wave force" (what people like to call "short power"). "Being soft is related to muscle relaxation, and/or diverting an opponent's attacks by using his own power or momentum against him. Aikido is not internally-oriented (by my definitions), yet it uses the principles of being "soft" all the time. Uechi-ryu and Goju-ryu Karate stylists employ both direct-forceful striking techniques with tense muscles and "soft" blocks and diversions." 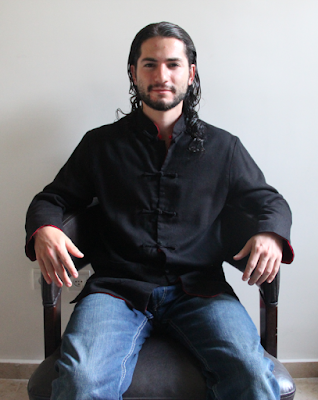 Part 2 of Jonathan's book is less a technical guide and more a treatise on the Daoist underpinnings of Eastern martial philosophy. In its rather random structure, it succeeds in echoing precisely the Daoist's view that, unlike knowledge, wisdom cannot be structured in any particular way that is "correct" or even "optimal". Rather it is best reflected as art - poetry. In this respect, Part 2 succeeds admirably. Finally, Part 3 wraps up Jonathan's text with a series of rare and insightful interviews with luminaries such as Chen Zhonghua, Neil Ripski and Itzik Cohen (who gives an account of the "Spirit of Okinawa"). 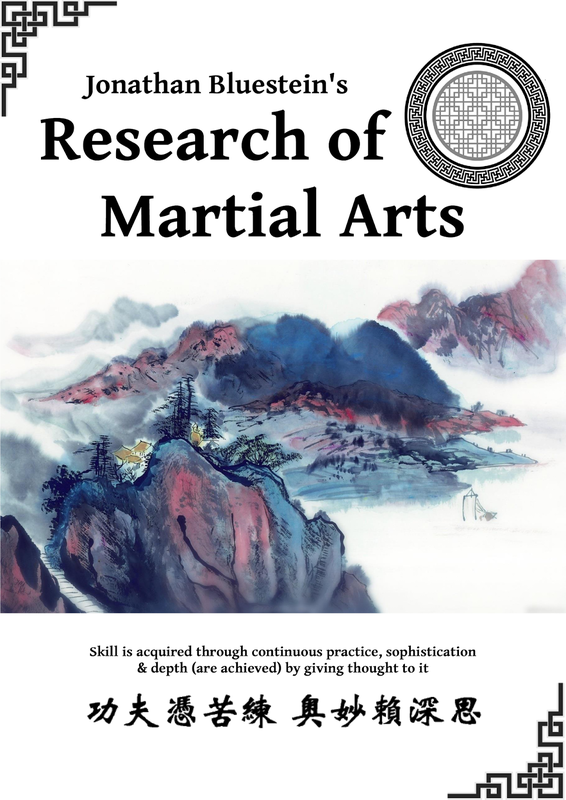 If any criticism of "Research of Martial Arts" is to be made, it lies in the scope of the book. In many ways it seems a bit too wide. Others might have decided to split the 3 parts into separate, shorter books. As it is, the book is quite daunting in its size. On the other hand, I think this reflects Jonathan's personality and I doubt he would have it any other way. Such things are, after all, a matter of taste. And Jonathan is to be commended for doing things his way and no one else's. On another note, I'm not terribly enamoured with the layout of the book, finding the headings a little too chaotic for my liking (I have never been a fan of underlined headings, for example). Again, this is a matter of taste - and at least Jonathan's structure is logical and consistent, moving from Parts to Chapters to Sub-Chapters. In the final analysis, what Jonathan has achieved is really something a martial artist can realistically only hope to achieve once in a lifetime - the holy grail of putting down what is (in Jonathan's case) a considerable body of knowledge and accumulated wisdom into one treatise. The fact that he has done so at what is a relatively young age (for martial arts mastery, anyway) makes me wonder what he will do now - and how much he might want to change future editions (perhaps by adding more material - or changing some of it). 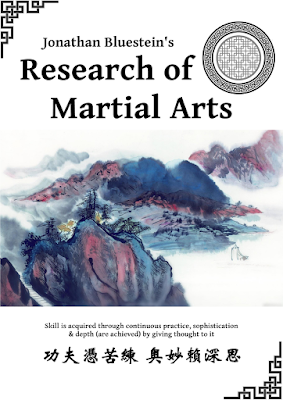 For now, "Research of Martial Arts" is a mammoth undertaking that contains a large body of knowledge particularly relevant to internal martial arts students. Those of us who dabble in both external and internal martial arts styles will also find it informative. With its detailed descriptions and generous illustrations, Jonathan Bluestein should be commended on a very impressive achievement. Those wanting to purchase a copy or find more information can go to Jonathan's site here. Another video to be released shortly! Bridging Hard and Soft DVD now available! Coming soon - Dan's first DVD release!